Sweater, main shade : 36-41cm 100g, 46-51cm 200g, 56cm 300g. Cardigan, main shade : 36cm 100g, 41-51cm 200g, 56cm 300g. DK tension 22st/ 30 rows to 10cm, 4mm needles. 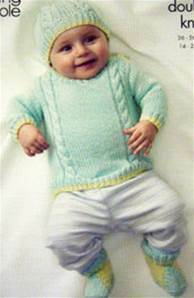 Shown in King Cole Bamboo Cotton DK, also suitable for Baby Comfort or other DK. 3.25mm, 3.75mm and 4mm needles, cable needle. 3 buttons for sweater, 4 for cardigan.